Angelique Kerber and Victoria Azarenka also reach the stage of the final eight. Former World No. 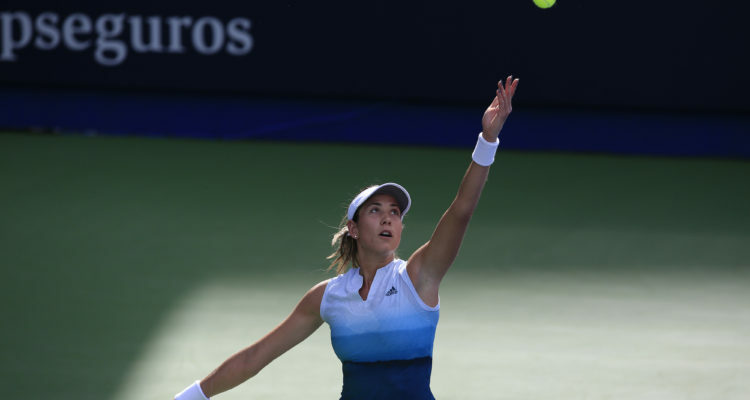 1 players Garbiñe Muguruza, Victoria Azarenka and Angelique Kerber were in action Thursday at the Abierto GNP Seguros in Monterrey, Mexico. The WTA International hard court event, which started the week with a draw of 32 players, is down to the last eight. Defending champion and No. 2 seed Muguruza from Spain moved a step closer to retaining the only singles title she won last year when she beat 75th-ranked Margarita Gasparyan of Russia, 6-3, 6-7 (1), 6-2, in two hours and 39 minutes on the Cancha Central at Estudio GNP Seguros. The 19th-ranked Muguruza rebounded from an early break down in the final set and won the final six games of the match to advance. She hit 40 winners to offset 46 unforced errors. It was her seventh straight Monterrey win. In Friday’s quarterfinals, Muguruza will face No. 7 seed Kristina Mladenovic of France, who advanced over lucky loser Greta Arn of Hungary, 6-0, 6-2, in one hour and 18 minutes. Mladenovic won 77 percent of her first serve points and was not broken by the 403rd-ranked Arn. She broke her opponent’s serve five times en route to just her fifth victory this year. The 66th-ranked Frenchwoman began 2019 with a four-match losing streak and didn’t garner her first victory until the first round of Dubai in February. Her biggest win to date this year came when she upset World No. 1 Naomi Osaka in the second round of the Emirates tournament. This is the deepest Mladenovic has gone in the nine tournaments she’s played this year. Meanwhile, the fifth-seeded Azarenka from Belarus came into her match against Zarina Diyas of Kazakhstan with a 1-0 head-to-head advantage. She had defeated Diyas en route to lifting the trophy at Indian Wells in 2016. On Thursday, Azarenka beat Diyas, again. This time, she needed just 67 minutes to win 6-3, 6-2, on the strength of 22 winners and six service breaks. Next, Azarenka will oppose No. 3 seed Anastasia Pavlyuchenkova of Russia, ranked 33rd, in the quarterfinal round.
.@AngeliqueKerber completes the @Abierto_GNP quarterfinal lineup! In the last match of the evening, Kerber, a two-time Monterrey finalist (2013, 2017) who is seeded first, faced 109th-ranked Karolina Muchova of the Czech Republic for the second consecutive tournament. The German came from a set down to beat Muchova in the second round at last month’s Miami Open. This time, Kerber won 6-3, 6-4 in one hour and 24 minutes. Next, Kerber will face No. 6 seed Kirsten Flipkens of Belgium, a 2016 finalist, in the quarterfinal round. One other quarterfinal matchup was set after Wednesday’s play. It will feature No. 8 seed Magdalena Rybarikova of Slovakia against No. 134 Sachia Vickery of the United States. The two faced each other in Monterrey qualifying last year, won by Vickery. This entry was posted in WTA Tour News and tagged Garbine Muguruza, Monterrey, WTA.